Hakeem Adam for OkayAfrica: Where did the story begin? What about riding through African cities encouraged you to make Africa Riding? Liz Gomis: The story began when I was living in Montreal in 2008. 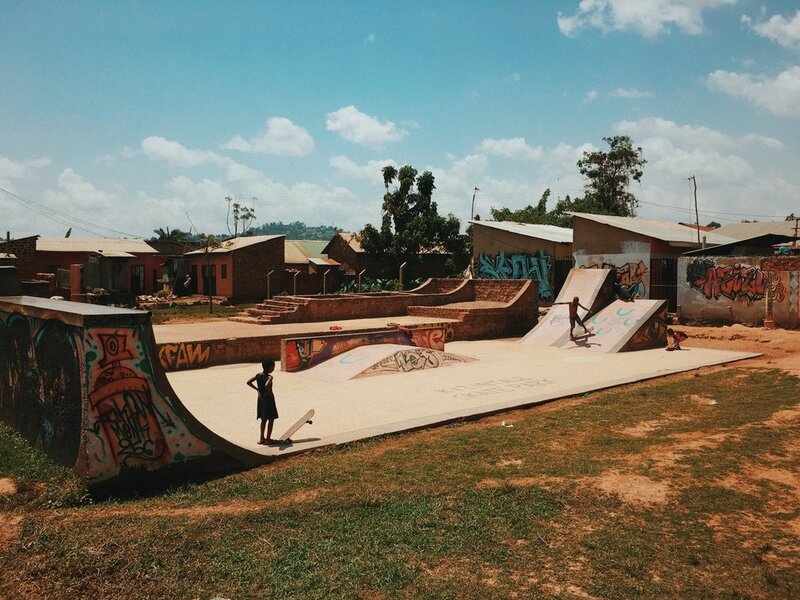 I discovered the work of Yann Gross the Swiss photographer about a community of skaters in Kitintale, Kampala. His photographs were magic for me. Young people just like me, living their best lives with a single homemade halfpipe, stuck in a sugar cane plantation. I don't know why, but in my head I was like, "I'll go there one day to experience this." Each character brings a new dimension both culturally and politically to the activity of riding and moving through their city, either for leisure or work. How did you find these characters and what about their stories made them stand out and be suitable for the documentary? Instagram is the best stalking tool if you need to find someone or something. The first person I was looking for was Jackson—the one who built the halfpipe in Kitintale. I found him quickly because he had a Facebook page. For the others, Instagram helped me a lot as well as word of mouth. For Modou's episode in Senegal for instance, because he was a friend's friend in Dakar, Whatsapp connected us. We had a small budget so we were not able to go and visit them before filming. So I just called them constantly, talking with them first and then interviewing them for hours and then keeping in touch and building a long distance relationship. I had to be close to them if I wanted to have original and genuine stories. These eight young people were chosen because their visions were clear, they didn't want to leave their country for a so called "El Dorado" in the western world. They felt like their passion, their work and commitment was worthy. For these reasons, I chose to stick with them. It's very good that this project looks at riding in more than one African city. Typically, because of the cost of travel across the continent, it's difficult for filmmakers or artists to synergize their content and make it relatable in more than one country. How did you manage to overcome this constraint and produce the show in three countries? Four countries actually! The production did a great job trying to find the best deals for planes, accommodations, post production adjustments and all. We made sacrifices with the equipment too. It was shot with 2 Sony A7S cameras, no stabilizer, not a single fancy gadget or such. And, we were a reduced team of three people: DOP (Aurélien), Sound Engineer (my older brother Fabien) and myself. Aside from travel logistics, what were some of the other challenges you faced in producing the documentary—considering it cuts across language and class barriers? Was it a project that you knew beforehand would find its way easily into distribution? We proposed it to ARTE TV before filming. Self-production is too hard. I'm still working on a documentary about Togolese music in the 70s and it's a nightmare to finish the project because of the fact that we were not 'structured' when we started and we didn't have any distribution opportunity. So learning from this mistake, I started to pitch the project to my former producer (I worked on a TV show with him in 2016) knowing that I had a contact to approach ARTE TV. Finding distribution is really hard when it comes to topics involving Africa. In France, we have a distorted vision of what is Africa today. People are still stuck in the 60s thinking that the continent is a place where there are only wars, diseases and dictatorships. So if you show up with a project that doesn't depict those things, they will tell you, "It's not concerning." Concerning to who or what? A vision of the past that is so obsolete. Arte, for me, was the only channel able to take the challenge. And that's what happened. They loved the pitch and when we came back with episode one, I think it was obvious that we had a good project in hand. The stories of women like Dominique in Ghana and Marion in Uganda were quite insightful in showing the challenges that women riders face in African cities and the work they keep doing to help change the perception of other women towards riding. Are there other ways by which we can actively increase the number of women cycling and skateboarding in our cities? The day we'll have an international champion, families, people and communities will change their mind about women practicing those kind of activities. And you'll see more girls involved in these sports. When we were filming Marion, we met another girl who told us, that Marion was inspiring her to ride her bike and try to find a life in this sport. It's just a matter of who is taking the lead and how does that woman is doing it. But, I really think it's not only an African issue. It was the exact same thing in western countries. Women are still marginalized and they don't get the credit men do. The series also very subtly highlights the need for community, as each of the characters are part of some group and did take part in riding, which can be an individual activity as a group. What do you think are some of the challenges these groups like Surf Ghana with Chance and Dominique as well as Jackson in Uganda and how can we help address them? The challenges are only related to access of equipment and decent conditions to practice. Their wealth is their community. This is a strength and that's why they can face these hard conditions. Give them half of what a kid in France or the U.S. has access to and you'll see how they will take the discipline to another level. For me there's also a question of the politics of space in African cities as the percentage of paved roads and highways may not be enough to get you everywhere via riding. This as well as the hostility of public spaces like mall parking lots, parks etc. means riders have to get very creative. In creating the series, what were some of the clever ways that riders resorted to, to find space in their cities? They are really conscious of the danger. Apart from Karim who's riding in the hills of Kigali, the others are not riding on the road because of traffic jam, cars, public transportation, taxis, motorcycles and all. So they all adapted their practice to cities that are not very welcoming by building and reinvesting safe places: under a highway for Surf Ghana in Accra or places in front of the university in Dakar. Just like a lot of skaters in the world, you'll find your place inside the hustle and bustle, through the hostility of the people or the cops—but wherever you are, you'll skate! Skating is about being free to practice, so you'll always find a solution no matter what. Africa is worse because the roads are chaotic sometimes, the sidewalks can be nonexistent but there will always have a central place or a nice building with stairs to ride, right? After completing the series do you thinking riding can be a viable means of transport in congested African cities like Kampala and Accra where traffic continues to grow? Do you think the exist road infrastructure can support such a shift? Difficult to say. But I saw some very good rollerbladers in Dakar riding long distances on the road. So nothing is impossible. But if you think of it, just like riding a bike in Amsterdam, of course not! What has the support for the series been since its release? The support we have was from the audience which was discovering a face of Africa they didn't know about. They just saw youngsters doing their thing and they felt "concerned" by their practice and issues as young people. One million views for Karim's teaser on Facebook says a lot about what people think. And I'm not mentioning the multiple messages we received on social media telling us that we did great job. Honestly, I didn't think that people would be so connected with us like this. But it feels good to know that we touched people with our work. What's next for you as a filmmaker/producer? Are you working on any new project around African stories? Is Africa Riding something you intend to return to? I'll have to finish the "Togo Soul 70" documentary I was talking about. I pitched another story to Arte, still related to sport but this time focused on women. And I found some more stories to develop while in Kenya last December. But I need to find distribution first. And of course, I'd be glad to film an "Africa Riding Part II" in Tanzania, Ethiopia, Morocco and maybe Angola! Hakeem Adam is an instinct creative in love with beautiful sentences and the angst of communicating complex ideas in poetry. He frequently expresses this angst in simple sentences on his blog. He also loves to talk about African film and music classics on his platform, Dandano. Keep up with Hakeem on Twitter at @mansah_hakeem.